Deep Landscapes, like certain landscapes, are spaces of our memory or fragmented ‘sceneries’ of memory. These particular memories are calm, warm, dreamy and occasionally disturbing. They are as wide as infinite spaces of intimacy. In them we daydream, picture things, float through them and explore them with our senses. Hues of imagination guard that space. These ‘deep landscapes’ are materialized through the image of the spaces of our memory. The exhibition presents a work that uses a photo found in a family album from 1944 titled Deep Landscape. Deep Landscape embodies persons part of a mosaic, which stems from deep-seated family memories, placed in the context of a landscape. Other works: Past, House, Room and Ancestral Forest (Prokletije) come into existence as fragments and scenes which sum up the experience of the intimate space. The exhibition presents several objects made by using various items of clothing that I own. Objects in our lives are particularly personal and fairly intimate; they are a means of self-representation in the outer world and constitute a part of our identity. They are part of our memory and agents of leaving traces. Clothes are specific because they complement and partially determine our own appearance. Accordingly, they represent a core part of our visual appearance. 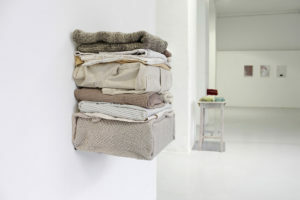 In the exhibition “Laundry”, clothing items function as sculptural material and their structure and colour are used as any other painting or sculpting media. This exhibition represents part of a research where the function of clothing is reversed and their particular burden and memory they possess gets ‘cut’ by a newly made form – as artistic objects. Neatly folded or wrinkled, the work should be seen as an intention to step out of the transformed personal and intimate space through its actual presentation and representation.